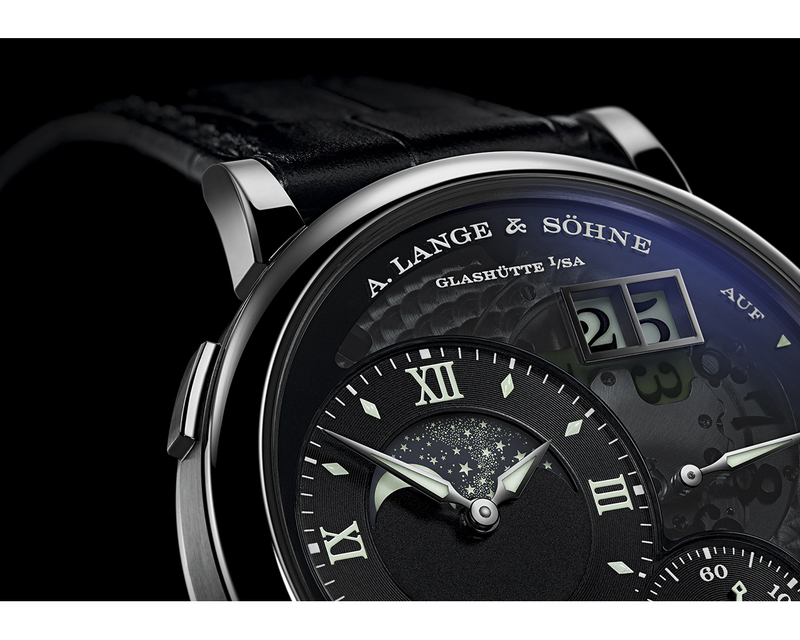 In 2013, A. Lange & Söhne introduced the Grand Lange 1 “Lumen”, a watch with a semi-transparent sapphire-crystal dial that exposes the ingenious disc configuration of the Lange outsize date. 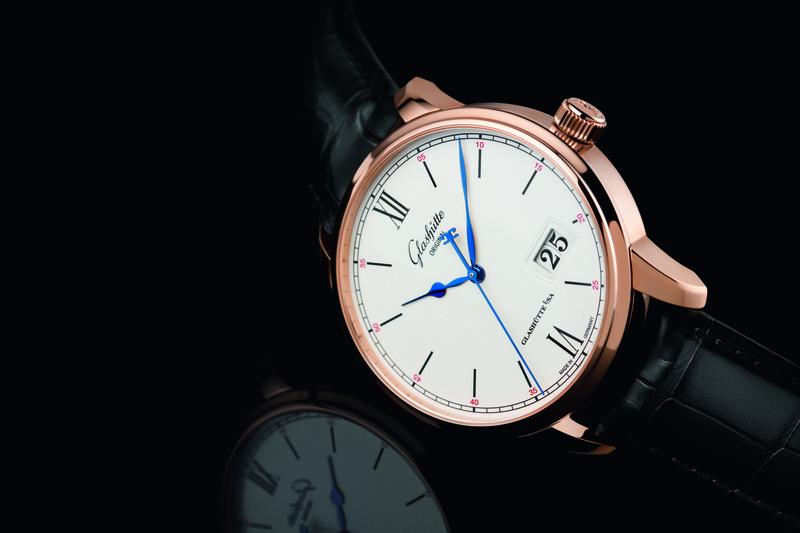 It was followed a year later by the Grand Lange 1 Moon Phase with a prominent in-dial moon-phase display that reproduces the lunations with an accuracy of 99.998 per cent. 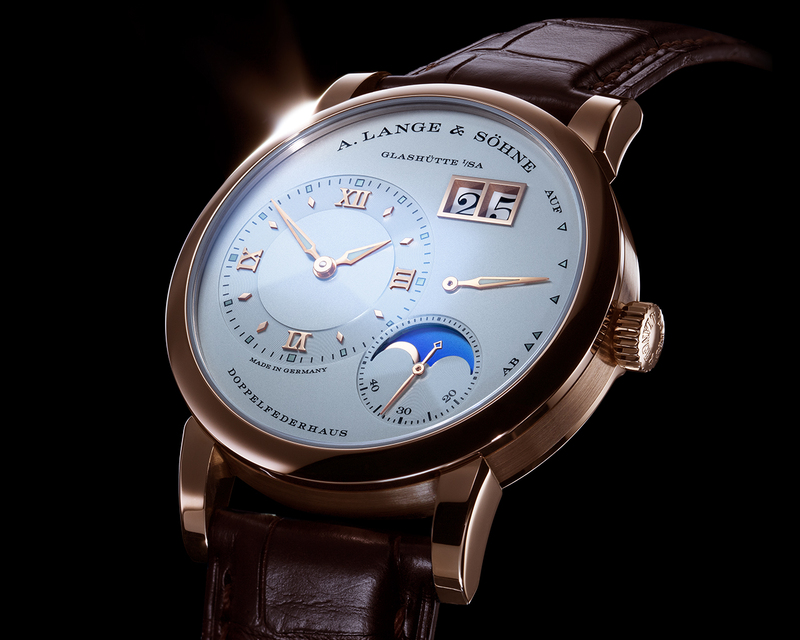 Now, the Grand Lange 1 Moon Phase “Lumen” combines these two remarkable accomplishments in one watch. 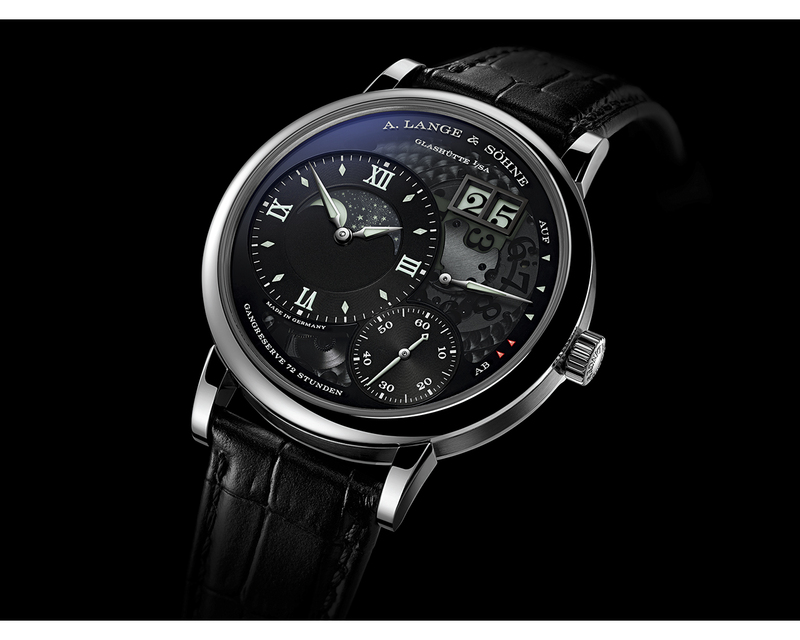 The watches of A. Lange & Söhne are known for being elegant, sophisticated, elaborate and understated – not exactly “cool”. 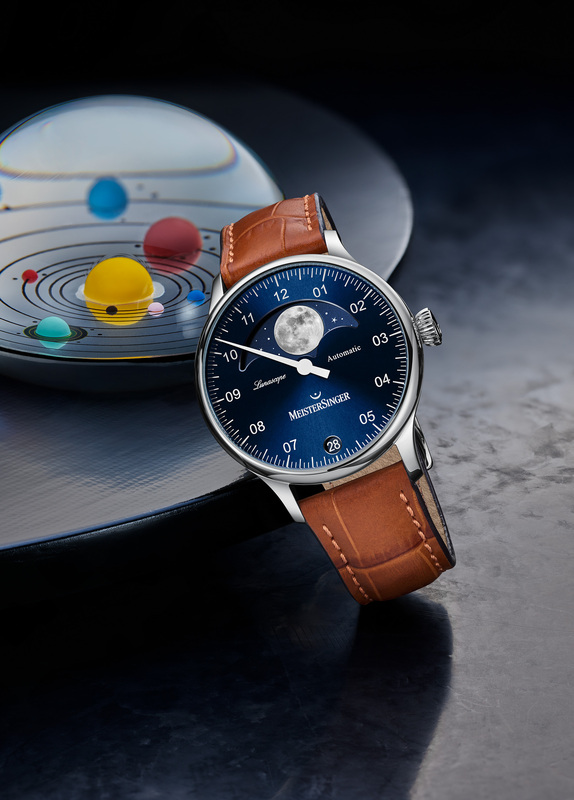 But with the Grand Lange 1 Moon Phase “Lumen” the watch manufacturer presented a watch, being all what we expect from A. Lange & Söhne while being – well – cool. The dial of the new model is made of blackened silver with ample apertures and black-tinted, semi-transparent sapphire-crystal glass. The special clothing applied to the glass blocks most of the visible light but not the UV spectra that “charge” the luminous pigments on the outsize-date mechanism and cause them to glow in the dark. The tens cross is coated with a white luminous compound and printed with black numerals. Conversely, the units disc, also featuring black numerals, is made of transparent glass and rotates in front of the luminous background of the date aperture. Different from Lange’s previous moon-phase models with solid-gold lunar discs, the Grand lange 2 Moon Phase “Lumen” has a disc made of glass. Initially, its surface is treated with a coating process. In a second step, a laser is used to cut out 1164 stars and the moon. Thanks to the luminous compound behind the lunar disc, they shimmer with vibrant radiance. 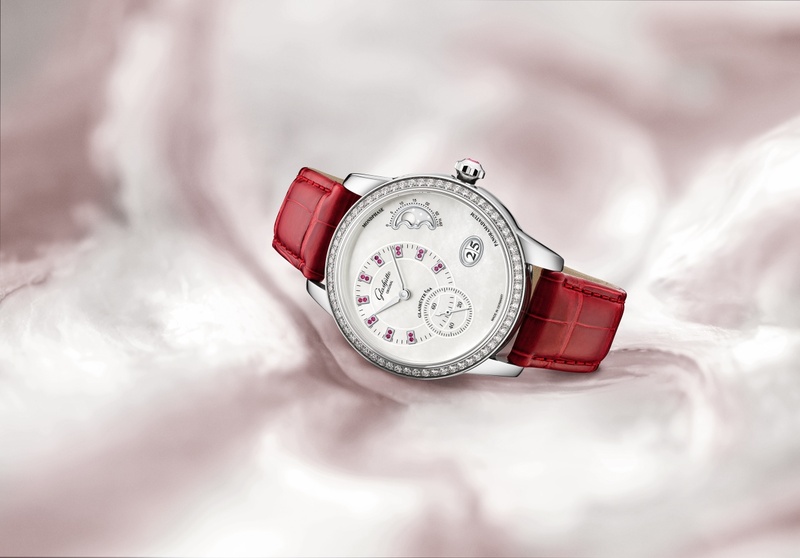 The large moon-phase display occupies a prominent position on the main dial. Once properly set, it only needs to be corrected by one day every 122.6 years. Between one and four o’clock A. Lange & Söhne placed a big power-reserve indicator, at five o’clock there’s a small second. 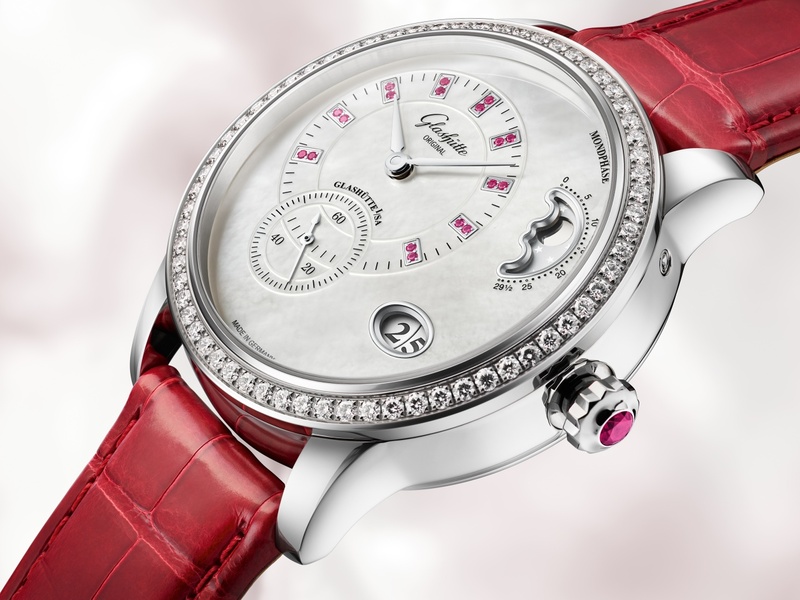 The watch is powered by he manually wound calibre L095.1. 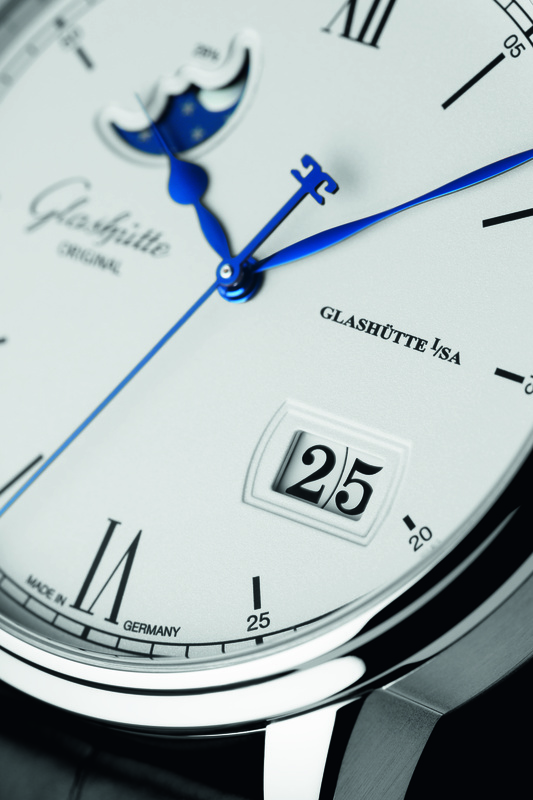 It is elaborately finished, the three-quarter plate made is decorated with Glashütte ribbing. The large mainspring barrel delivers power for 72 hours. 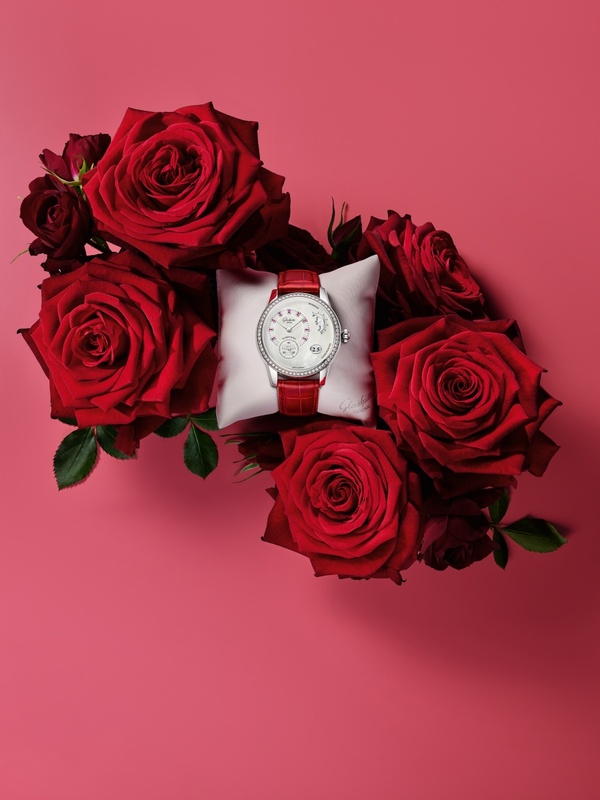 The calibre is housed in a 41-millimetre platinum case. 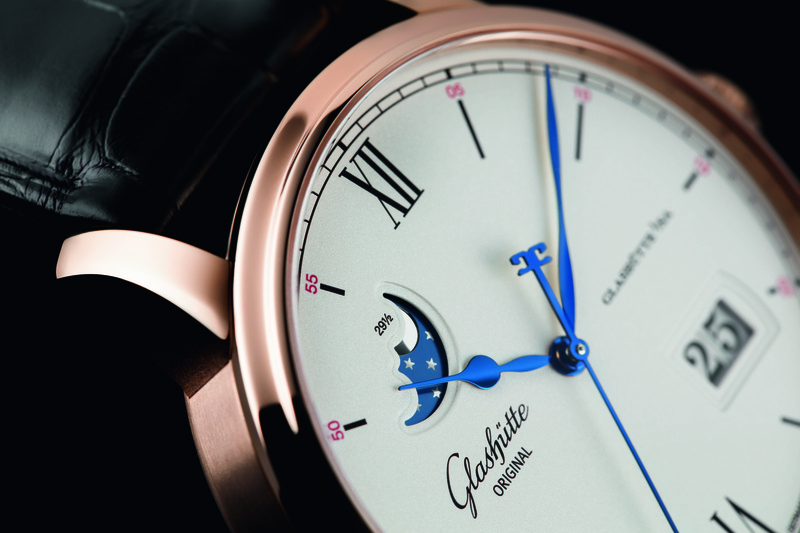 The Grand Lange 1 Moon Phase “Lumen” is a limited edition of only 200 watches. 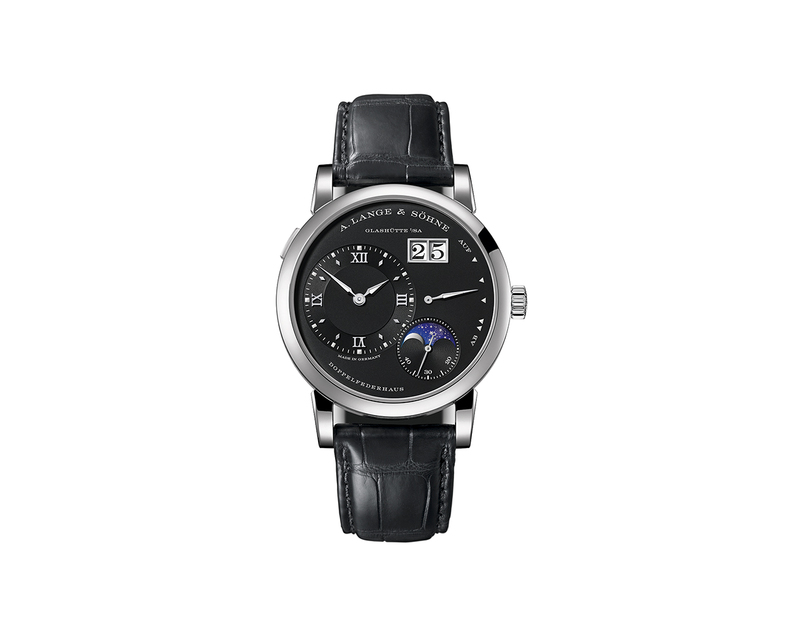 The Lange 1 Moon Phase by A. Lange & Söhne is around since 2002. 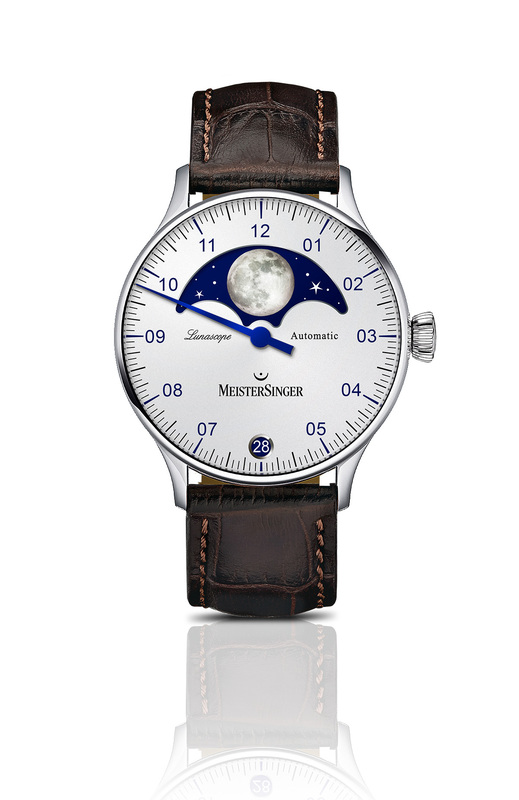 The Lange 1 received an upgrade quite recently and now it’s the turn of the Lange 1 Moon Phase. The watch now comes with a new calibre and the moon phase has also changed: it now contains a day/night indicator as well. The arrangement of the moon phase display is based on a new, particularly realistic concept. A separate solid-gold moon pursues its orbit in the foreground. Behind it, a celestial dis – also made of solid gold – performs one revolution every 24 hours. On the disc, the different times of day are represented by varying blue hues caused by interference effects. During the day, it shows a bright sky without stars, while at night it depicts a dark sky with prominently contrasting laser-cut stars. The lunar cycle endures 29 days, 12 hours, 44 minutes and 3 seconds on average. The Lange 1 Moon Phase displays it so accurately that it takes 122.6 years for the display to deviate from the true synodic period by just one day. The asymmetric solid-silver dial sets a harmonious stage for the luminous time and power-reserve indications complemented with an outsize date, the moon-phase display, and the day/night indicator. 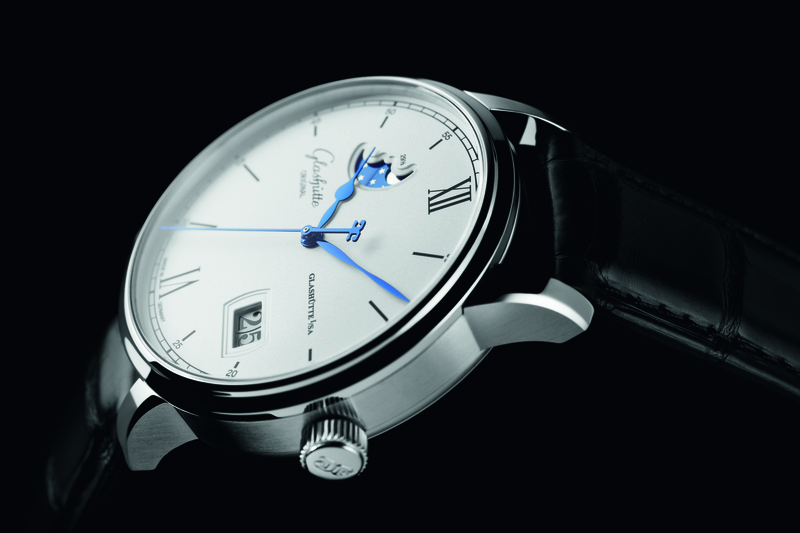 Hours and minutes are displayed on a big subdial at 9 o’clock, the power-reserve indicator lies below the date at 3 o’clock. 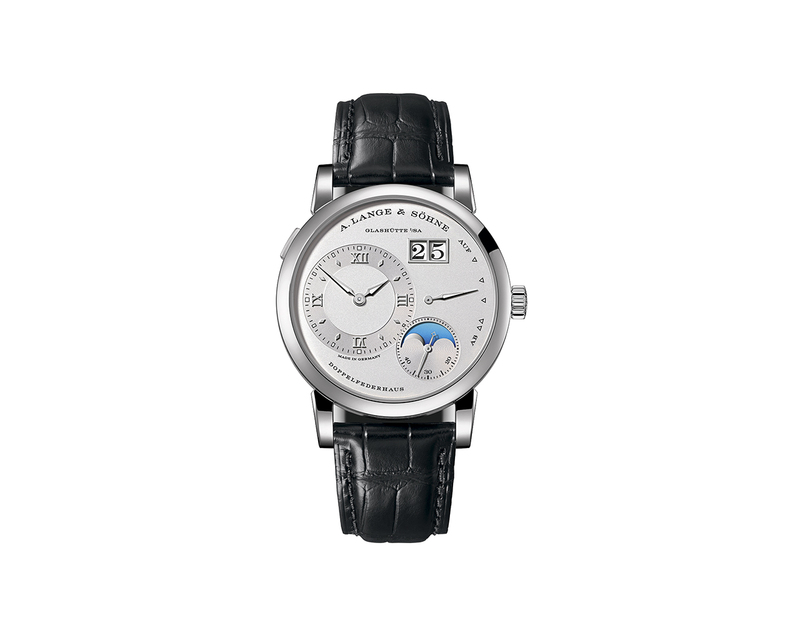 And A. Lange & Söhne incorporated the small seconds in the moon-phase display. The now 20th (!) Lange calibre with a moon-phase display is based on the Lange 1 movement introduced two years ago, and it has the same performance attributes. 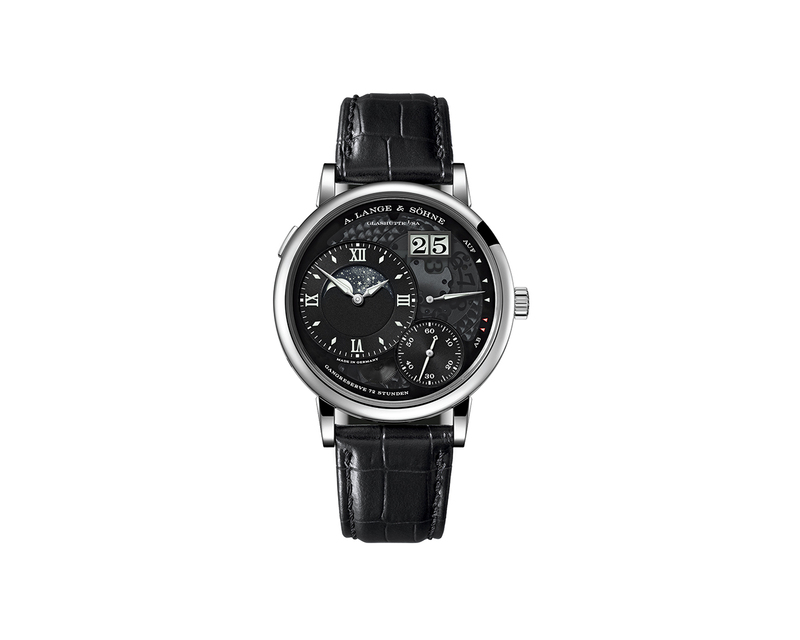 This includes the maximum power reserve of 72 hours and the precisely jumping outsize date display. It beats with a frequency of 21,600 semi-oscillations per hour. The 70 parts for the moon-phase display were so integrated in the L121.3 manufacture calibre that it is only marginally larger than the calibre L121.1 inside the Lange 1. The Lange 1 Moon Phase is available in white gold with a black dial (39.500€), in pink gold with an argenté dial (35.900€) and in platinum with a rhodié dial (52.000€). Also, A. Lange & Söhne can now be found on Instagram. Apart from news and new models the manufacturer wants to offer exclusive looks behind the scenes.